Cultfinder has been around for a few years now and this is their second EP and it features a few old tracks and a few new ones with a very dark opening intro! 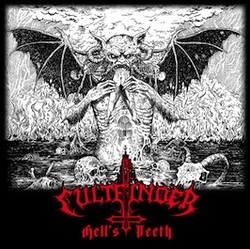 Cultfinder is a black metal outfit with a thrashy side to it. I would say it is more black than thrash but that is all semantics! The sound is very old school on here and sounds like it came from the late 80s actually, which is before the genre labeling became so splintered, so we will just call it metal from this point forward. The production on this CD is pretty raw to be honest, sounding almost more of a demo than a true EP (no surprise as some of them are re-recorded versions of songs that did appear on their demo. The drums are a bit tinny sounding and the rest of the production is pretty minimal, but in a way that sounds good as it helps to give it that old school feel! The tracks are a bit uneven for me with some of them not really appealing to me at all, while others such as The Devil's Whore, Morbid Breed and especially Drink To The Devil being very solid and memorable. That may be just personal taste however as I am very choosy when it comes to my black metal intake. I definitely come from a more thrash oriented background so that plays into it a bit. Overall a nice dirty and brutal EP with some nuggets thrown in there. The production is not real solid but it doesn't really adversely affect the enjoyment of the CD and in some aspects might even add to it. Definitely worth a listen if you like a bit of thrash in your blackery or vice versa!